A few months ago I woke up with a question in my mind: how can I create mythological themes in fashion photographs? This came up after I decided to create an entirely new portfolio for advertising and commercial work that reflected my style and interests present in the fine art series I’ve been creating for the last few years. I believe some of the most powerful images in fashion and beauty have a timeless feel to it, and I was intrigued by the idea of infusing mythological and folklore themes into my new work in these fields. I had done a shoot with my wife, dancer Iana Komarnytska, wearing a traditional Ukrainian flower headband. She told me about the fairy tales of Rusalka (русалка in Russian), a kind of mermaid or water nymph present in Russian, Ukrainian and Polish folklore, featured all over literature, film and paintings. As I researched the origins of rusalka, I got intrigued by the evolution of the concept in culture across time and its relationship to other mythological figures such as Celtic mermaids or Greek sirens. Rusalka stories have roots in pagan Slavic traditions and were linked to fertility, where they would come out of the water in the spring to transfer life-giving moisture to the fields and thus helped nurture the crops. 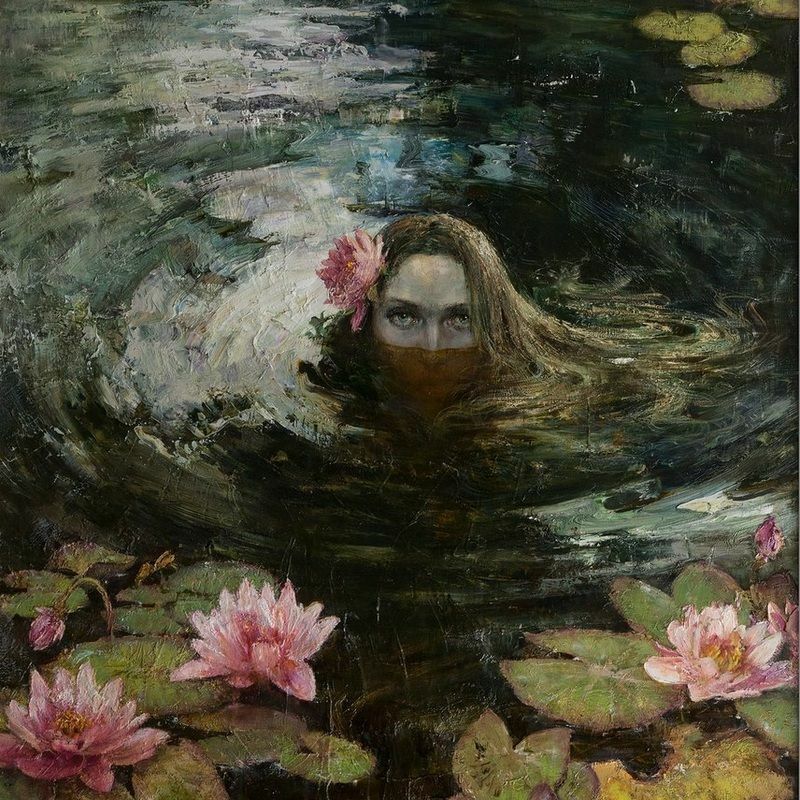 In the 19th century the concept of rusalka started to shift to a more menacing side, which reminded me of Joseph Campbell’s ‘The Woman As Temptress’ idea in the Hero’s Journey. According to folklorist Natalie Kononenko, "the currently dominant presents her as something like a mermaid, though she is pictured as having legs rather than a fish tail ... The current view of the rusalka as a seductive or seduced woman was probably influenced by written literature. In the past, her image was more complex and she more closely resembled a nature spirit, found not only near water but in fields, forests, and mountains”. I thought it would be interesting to re-imagine the concept inspired by elements of fashion, beauty and lingerie. I have always been inspired by John William Waterhouse, especially his Hylas and the Nymphs (1896). In his work, he often references mermaids and water related fairy tales, and for some reason his aesthetics always spoke to me. I also studied paintings from Russian artists such as Anna Vinogradova, who are embedded in a culture filled with stories of Rusalka and other related folkloric themes that embodies the aesthetic sensibility I was looking for. ‘Study for The Mermaid’ by John William Waterhouse. Selection of images on my mood board: purple headband, painting with colour palette, and make up style. To create this photo, I decided to collaborate with Russian model Alona Lytt, who had the perfect look for the image, Russian make up artist Victoria Khanlari, who is able to create a natural but creative palette, and Ukrainian designer Miss S-a Headbands, who was inspired by Rusalka stories to create her designs. I was assisted by my friend and fellow photographer Gloria Caballero. The elements of the photograph were fairly simple: the headband, the water, the model, the lingerie, the sky after sunset. When I set out to create this photograph I had a very specific image in my mind. Whenever I create personal work, I usually start with an idea but I explore many options when I am on set shooting. For this one, I decided to focus solely on creating one image. I would play around a little bit with composition, but mainly fine tune lighting and expression on the model. That decision was as much a creative exercise as a necessity of the conditions: I would have about 15 minutes to do the photo, since the light after sunset changes dramatically minute-by-minute. Original inspiration by headband by Miss S-a Headbands. Behind-the-scenes image of the Rusalka shoot at Lake Ontario in Toronto, Canada, with photographer Pedro Bonatto and model Alona Lytt. BTS photo by Gloria Caballero. The process of choosing the image and editing was very intuitive. Small variations on lighting, composition and model position and expression gave surprisingly different feels to the photographs, which would normally make it difficult for me to choose the best one. However, I decided to go over the images in full screen over a period of a few days and simply let the images speak to me. With that mindset, one image kept catching my eye, and I chose that one to edit. In terms of editing, I wanted to keep the colours and light very natural, so I did light skin retouching and colour correction, since the final look was already captured in camera. Overall, I am happy with the result and I am preparing quite a number of new shoots inspired by other mythological themes and I will feature them on my blog. I hope you enjoyed this exploration of the process behind the creation of this image. Also, I am considering creating a limited edition print of this photograph. I would love to hear what you think and if you have any questions. Technical information: Shot with a Canon 5D Mark iii, 50mm 1.2L lens at f5.6, 1/60s, iso 400, Profoto B1 with a 30” umbrella.